I love good bottle art. Bottle art is what I initially grade a soda on so it always confuses me when companies seem like they don’t care about it. I’m not saying everything has to be “Wizard mural on the side of a van” epic but it at least needs to stand out amongst the others. When I opened my fridge today to pick out a soda to review I wasn’t quite sure what to choose until I saw the bottle art on my current review. Capt’n Eli’s Root Beer has a label that tells a story… not many other root beers can say that. Actually I don’t believe that root beer can talk but that’s a debate for another time. What you see when you look at the label of Capt’n Eli’s Root Beer is a young child, which I will assume is Eli, rowing a boat out at sea. The waves seem a bit choppy for such a young kid but don’t fear too much for him as a house is in sight over his right shoulder and growing ever closer. Upon his left shoulder sits a parrot that I am now naming Murphy. Murphy and Eli have been together about 2 years, and since parrots live such long lives you’ll be sure to see Murphy on Eli’s shoulder for several decades more. Within the boat Eli is rowing sit 3 barrels. I can only imagine that these barrels are filled with root beer. I guess it could be rum, or oil, or tar, or unicorn blood, or even cream soda but since this is a bottle of root beer let’s stick with that. So the story here to me is that Capt’n Eli (which I suspect is a title he gave himself) has a root beer route. A root beer route is much like a paper route but the people on your route like you more since your product is delicious. About two years ago on this root beer route Eli noticed that one of his barrels was leaking. He did all he could to plug up the hole but failed. Shortly after he gave up a Scarlet Macaw flew down from a nearby tree and began drinking the spilled root beer. Well it turns out that this bird took to liking the bubbly concoction and Eli. 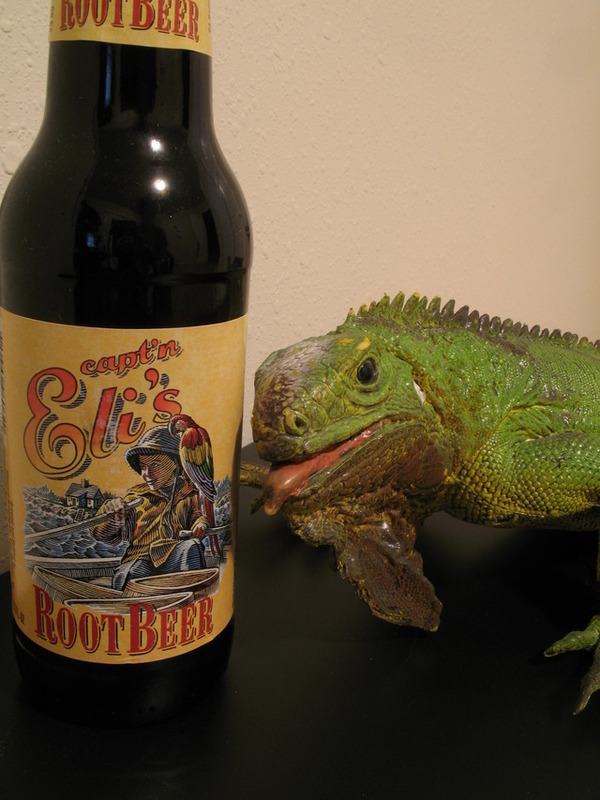 Ever since that fateful day Murphy the parrot has ridden with Eli on his root beer route, always looking to sneak a sip whenever he can. Oh the adventure they went on… but that’s for another day. Enough about those two, they have a business to run. Let’s see what else we can find on this label. Hey look ingredients and good ones at that. Let’s see what we got here: Water, Cane Sugar, Caramel Coloring, Natural & Artificial Flavors including Wintergreen Oil, Anise, Vanilla, Spices, Herbs, Citric Acid, and sadly Sodium Benzoate. Wow, we were almost 100% great with those ingredients until we came upon ol’ Sodium Benzoate. That list of ingredients reminded me a little bit of the ingredients you’d find in a Virgil’s Root Beer. If they’re lucky then their flavor will be something close to it as well. Let’s take a whiff. The first thing I notice is that you can really smell the wintergreen. Capt’n Eli’s Root Beer has a very strong root beer aroma as well. I think the word I’m trying to think of here is “rooty”. Time to drink! Very nice, this ranks up there as one of the smoothest root beers I’ve ever tasted. The carbonation is faint as far as root beer is concerned and the flavor mellows out a lot in its finish. The middle portion of this beverage reminds me a little bit of root beer barrels candy. Now normally I’d try and tell you which of the three main stream root beers this tasted like… Barq’s, A&W, or Mug. For the first time ever I have to compare the flavor to that of Virgil’s. Now I’m not saying it’s better than Virgil’s but I am saying that it should at least share a flavor comparison. This shouldn’t come to you as a shock since they share a handful of ingredients that other root beers do not. I do find it odd that I’m ending up with a bit of film in my mouth after each sip. I didn’t think I would have this since it’s sweetened with cane sugar but there it is. At least the film isn’t unpleasant. With each lick of the top of my mouth I’m reminded of the root beer barrel candy flavoring again, although now it’s much fainter. I’m noticing that as I reach the bottom of the bottle the wintergreen flavor increases. This is a good thing in my opinion since it allows those of you who couldn’t taste the wintergreen another more obvious chance at it. Overall this is a very good root beer. It has a nice line up of ingredients, sans the Sodium Benzoate. The flavor is above average and the labeling is fun. I can only hope that other companies take notice of labels like this and begin to rethink their designs as well. Twist's favorite flavor is parrot.